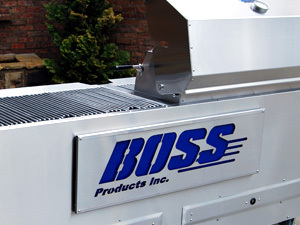 Boss Products, Inc. was created in 2001 with a former division of a family business that is currently in its third generation of ownership. The family business specialized in Catering and Fundraising utilizing as its foundation the patented Port-A-Pit® machine invented by the founder, Nelson Gongwer. When the third generation took ownership, three Gongwer brothers decided to utilize the parent company to form three separate more specialized companies. With a passion for designing and developing innovative new products, Troy Gongwer had the vision of creating a new company utilizing the existing manufacturing and leasing divisions of the family business. Troy's vision for the “new” company was to focus on developing and marketing innovative equipment built with long term value for the Foodservice and Catering Industries. Utilizing Troy's extensive Catering and Foodservice experience and taking into consideration requests and desires expressed by many large scale food service organizations across the country, our line of products was born. Designed with the customer in mind all of our products share an unparalleled level of innovation, durability, and function. Identifying the need for equipment with the versatility to be used in offsite or remote locations, (Disaster Relief sites, large outdoor venues, etc.) we designed several key products to operate on energy supplied by LP Gas Tanks without a need to access electricity. Our re-thermalization ovens, muti-function grills, mobile serving carts and Port-A-Pit® machines are currently meeting the high volume demands at numerous large venues such as NASCAR Tracks, Professional Sporting events, Disaster Relief Sites and Resorts across the nation. The Boss Team has made a commitment to identify the needs of the consumers in a wide variety of industries and create viable solutions through innovation and team work. Building a “Stainless” reputation along the way and to ensure that Innovation, Excellence, and Integrity are reflected in everything we do.